The movie was shot in 1957, during the summer. It turned out to be the last movie that Ty completed. He died just over a year later, while filming the movie Solomon and Sheba. Upon finishing the movie, Ty went into another of the stage tours that he so much loved doing -- Back to Methuselah, by George Bernard Shaw. Witness for the Prosecution had a superb cast and crew. Ty's costars were the legendary actress, Marlene Dietrich, and noted actor, Charles Laughton. In a supporting role was Laughton's wife, Elsa Lanchester, who had previously appeared with Ty in Son of Fury and The Razor's Edge. 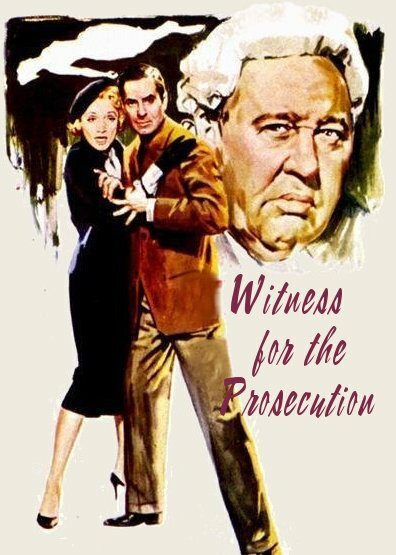 Witness was directed by the great Billy Wilder, who also co-wrote the screenplay, with Harry Kurnitz. It was based on a play by the Agatha Christie, the internationally renowned writer of mystery stories. The movie was nominated for six Oscars, including Best Picture and Best Director. The movie gave Ty the opportunity to play against type, and it was one of the movies that he commented were among his best. The other three movies that he named as being his best were: Nightmare Alley, Blood and Sand, and Abandon Ship. In evaluating his movies, Ty undoubtedly looked at these particular roles as giving him the opportunity to use his acting ability to best advantage. Sir Wilfried Robarts (Charles Laughton) is a brilliant defense attorney who is recovering from a heart attack. His resolve to rest is shattered, though, when he is presented with an intriguing case of murder. Leonard Vole (Tyrone Power) is an amiable man who is accused of murdering a middle-aged widow with whom he had been spending time. Circumstances surrounding the murder make Vole look very much like the killer, yet Robarts is convinced of his innocence. Christine Helm (Marlene Dietrich), Vole's wife, visits the attorney and tells him that she doesn't believe her husband is innocent, but she will testify on his behalf, giving him an alibi. Though Christine's attitude puzzles Robarts, he still believes that Vole is innocent and takes on the case. There are some twists and turns in this exceptional courtroom drama that should not be revealed, for the benefit of those who might want to see the film for the first time. The Nation - "It is a great credit to Tyrone Power that he holds his own in the comparatively inactive role of defendant before the bar and occasion for all the histrionics." 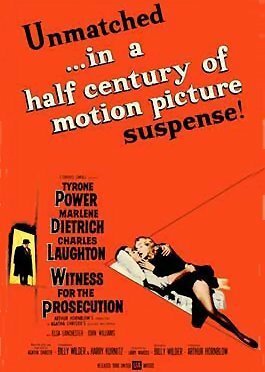 New York Herald Tribune - "Tyrone Power is expert as the accused killer, a difficult role since so much depends on his reactions to the interplay of question and answer, and he brings it off smoothly." Newsweek commented that both Ty and Marlene Dietrich "are unusually convincing throughout the various duplicities of conflicting testimonies."